It was with great pleasure that I read an article on Dave Smith in the June issue of the Fifty-Five Plus magazine. I have admired Dave Smith ever since I was a young teacher starting her career and discovering the social make-up of Canada’s capital. Trying new restaurants was part of the experience for this young farm girl who hadn’t had a chance to venture very far. Nate’s Deli was one of those places. I always marveled at the celebrities, both politicians and stars alike, who had frequented this place. I thought there must be something more than the excellent food! As I soon discovered, the man behind the business was a force to be reckoned with... a man of the world who was just as comfortable with the very poor as he was with royalty. Born in Ottawa to Russian-Jewish immigrant parents, the youngest of 13 children, Dave learned to be caring and giving as a child. He remembers his mother coming home one night, in the middle of winter, without her coat. He asked, “Mom where’s your coat?” to which she answered somebody needed it more than she did. This selflessness was a cornerstone that made him aware of other people’s needs and made him trust in his capacity to do what needed to be done to help. Dave has taken up more causes than I can mention here and has also picked up challenges outside the country, helping out in African countries such as Angola where living conditions and deprivation are intolerable. His wife, Darlene, shares his passion and is there by his side. They have no intention of slowing down in the near future. Through the years, Dave Smith has accumulated many awards and honours, but still he remains humble and says, “Yes, people want to honour you and give you things and this is great… But when you see the difference it makes; that’s what drives you.” Making a difference is what matters! Now for another person I have discovered through my good friend, Colette. Her name is Mireille Roy. Like Dave, Mireille learned at a young age to help and care for others. She fondly remembers going to her grandparents’ home to help and keep them company while her aunt ran errands. This is probably why she ended up working at St. Vincent Hospital where she was responsible for the volunteer staff. She later worked at Bruyère’s Continuing Care Services as an administrator and also volunteered at the JOC youth organization. Mireille started her project seven years ago, before the 2010 earthquake devastated Haïti. At the « Bâtisseurs de l’Espoir » centre, she set up sewing workshops where women learn sewing, knitting and embroidery. When Mireille is home, she puts together containers of sewing material to be sent to Grand Goâve. She dreams of building a sewing pavilion so that the sewing machines and the material can be set up in a permanent fashion. Mireille has expanded her project to Taino, a fishing village nearby. The women learn to sew practical garments, diapers, curtains, school uniforms and embroider tablecloths. Plans to include crochet lessons, smocking and needlepoint are under way. Mireille and her team of volunteers did not neglect the children who have nothing. The Children’s Play project was attended by 40 children, every Saturday. The girls were taught sewing skills, how to make jewelry while the boys experimented with making airplanes, wooden cars and boats which they painted and decorated. The rudiments of gardening were also taught. With two barrels of donated seeds, gardens were set up so the participants can feed their family. Among the containers that are sent out, there are toys for the children. Mireille tells me that my friend Colette St-Denis gave over 100 Barbie dolls and crafts material to be offered to the children and sewing material for the sewing co-op. Recently, Colette organized a benefit garage sale and collected over 600$ for the foundation. Others donate sewing kits. 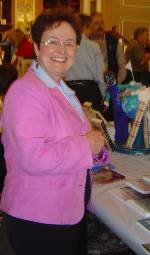 Claudette Lafleur purchases sandals and children’s clothing when they are on sale. Everything is shipped in containers that cost approximately 130$ to send. Mireille says it is the courage and “joie de vivre” of the Haitian people that keep her going back. Of course, her project would not have taken flight without the support and generosity of Canadians. Mireille tells me she will need around 15 000$ to build the new sewing pavilion. If you are interested in sponsoring the project, a donation of 7$ will buy a cement block for the construction of the pavilion. She has 18 containers of supplies, ready to be shipped out… so she still needs your help and generosity to cover shipping costs.